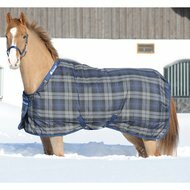 The Bucas Celtic Stable blankets are very strong, extremely durable and of excellent quality. These stall blankets have a polypropylene outer material and the Bucas anti-bacterial Stay-dry lining. The result is a blanket that can be used as a sweat blanket. A sweaty or wet horse will dry quickly, the moisture is transported outside so that the blanket does not have to be changed. The antibacterial lining keeps the blanket fresh and in good condition. The Celtic Stable has a Click'n Go front closure and overlapping, padded front and shoulder pleats that ensure a good fit and extra shoulder freedom. In addition, there is a smooth lining at the shoulders to prevent abrasions. 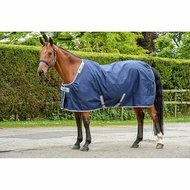 The stable blanket is available in three thicknesses; Extra, Medium and Light. All these thicknesses have attachment points for the Celtic Stable Combi-Neck, which is available separately. The Combi-Neck is easy to attach to the blanket and provides extra protection. Lined with a smooth nylon lining and Stay-dry fleece. Perfectly on the pony. Does not rub and does not shift. It is unfortunate that there is no witherskin available. This could be done perfectly with the velcro of the neck fastening. Blanket fits nicely around the horse. Sit like poured. Nice that it is a highliner for the withers. I have it for a year now. He stays well all night. After driving I put it on my sweaty horse on the next day you do not even see that the horse is sweating. No print of sweat nothing. The blanket on the inside also remains very beautiful. In our stables, 7 people have bought him. Great blanket, nice color combination. Fit well, sweat function very convenient. Ideal for cold nights. Question: How much grams of filling does this blanket have? Question: If I want to take size 205 for my horse, which size do you choose? Answer: Then you choose size 155/206. Question: Is this blanket waterproof? Question: Is the ceiling waterproof?